William Stanley Haseltine (1835–1900), Arco Naturale, Capri (c 1870), further details not known. Wikimedia Commons. The cradle of plein air painting in oils was the Roman campagna, where during the late eighteenth and early nineteenth centuries budding landscape painters had to go and paint. But other parts of the Mediterranean became popular – among them the beautiful sub-tropical island of Capri. Capri is at the southern side of the Bay of Naples, to the south-west of Sorrento, its north coast looking across the bay directly at the busy and hot city of Naples. It’s a small island, with two little towns: Capri in the east, which spills down to harbours on the north and south coasts, and Anacapri, nestling in the hills to the west. It is quite ruggedly hilly, with spectacular coastal scenery of high sea cliffs, small bays, and plenty of rock. Although only around 6 km (4 miles) long, it rises to nearly 600 metres (2,000 feet) at its highest point, Monte Solaro. It has everything to offer the coastal painter, including a superb climate, and a refuge from the bone-chilling winters of northern Europe. Among the more famous artists who have stayed on Capri are John Singer Sargent, who painted a series of works showing a local model, Rosina Ferrara, and Adrian and Marianne Stokes honeymooned there. Other famous people have lived there too: Gracie Fields, Somerset Maugham, and Compton Mackenzie. It is sometimes claimed that Capri only became popular with painters in the late nineteenth century. In fact, its fame started rather earlier. Carl Blechen visited the island in 1828, made hundreds of sketches there, and developed some into finished paintings when he was back in his Berlin studio. This painting of Tiberius Rocks, Capri (1828-9) seems to have been at least started en plein air, in oils on paper, although he may have finished it after his return. It shows the north coast, looking east to the peak of Monte Tiberio, with the Bay of Naples in the background. 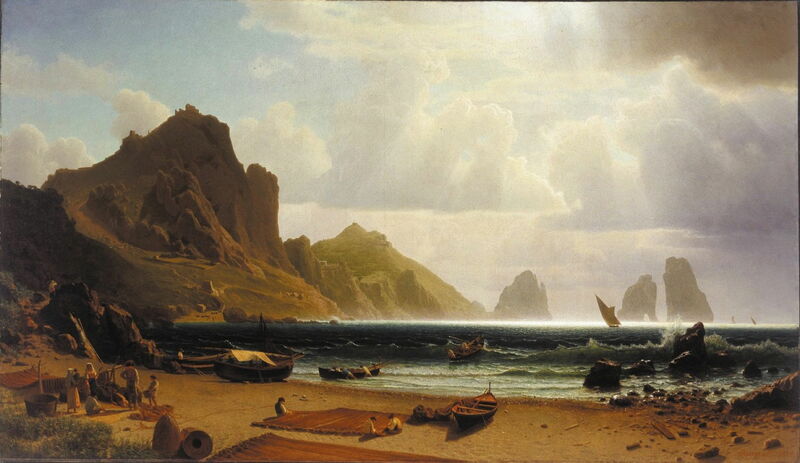 Carl Blechen (1798–1840), Marina Grande, Capri (1829), oil on canvas, 90 × 130 cm, Österreichische Galerie Belvedere, Vienna, Austria. Wikimedia Commons. 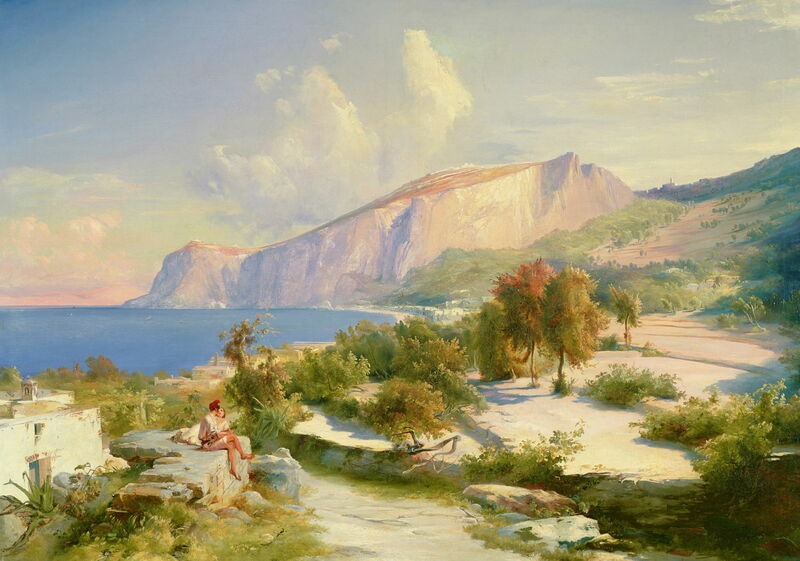 Blechen’s superb finished painting of Marina Grande, Capri (1829) was made in the studio, though. This shows the north coast again, looking from the west of the Marina Grande to the east, with the Tiberius Rocks and Monte Tiberio in the distance, and I think that may be Vesuvius in the far distance. This is the main harbour of Capri, now enclosed to give it more shelter from northerly seas. The viewpoint of his Tiberius Rocks, Capri above would have been atop the cliffs to the right of centre of this view, I think. Heinrich Jakob Fried (1802-1870), The Blue Grotto, Capri (1835), oil on canvas, 50 × 63 cm, Kunsthalle Bremen, Bremen, Germany. Wikimedia Commons. 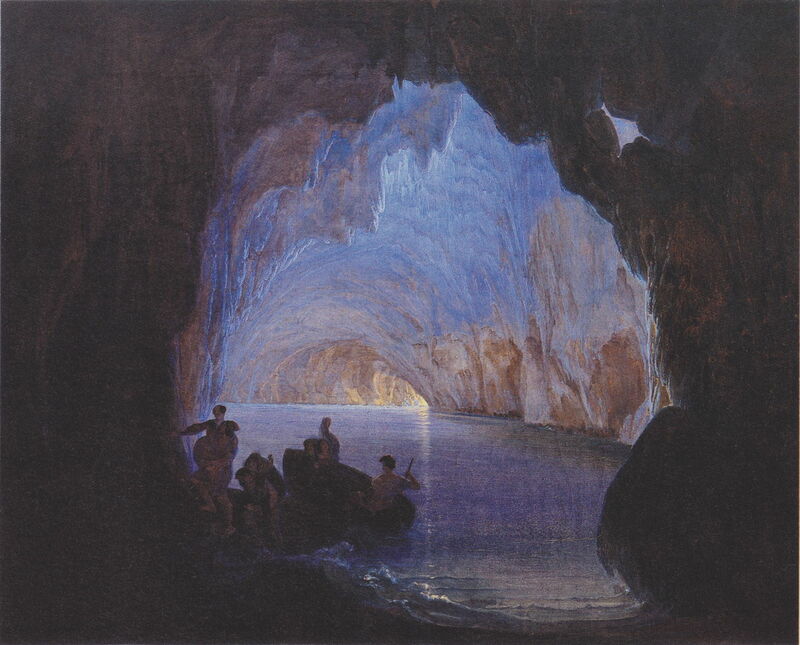 Heinrich Jakob Fried’s painting of The Blue Grotto, Capri (1835) shows one of the island’s most famous sights, which has been the motif for many paintings since. This has to be visited by boat, and is at the north-western tip of the island. It features in August Kopisch’s book, published in German in 1838, describing his re-discovery of the cave in 1826, which popularised the island in northern Europe. Fried visited the cave in 1835, and probably painted this in a studio in Naples shortly afterwards, just in time for the publication of Kopisch’s book. 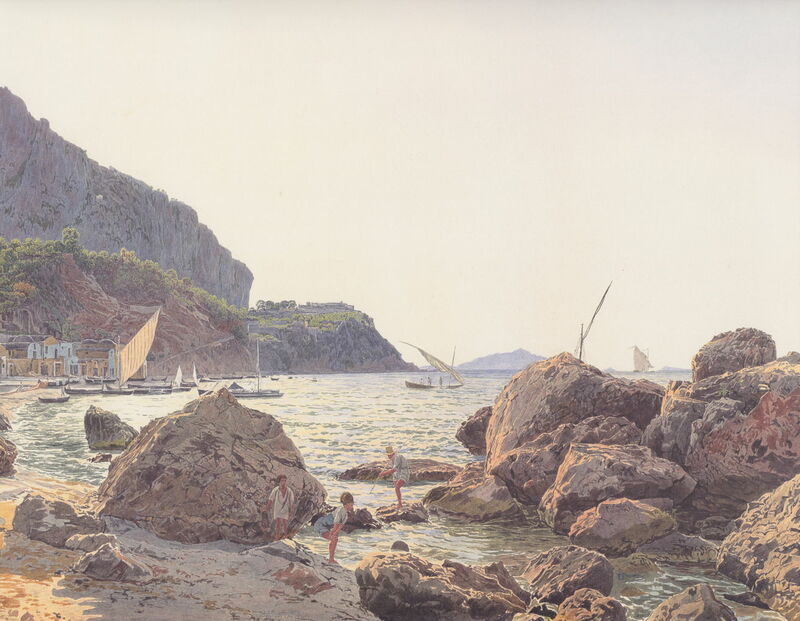 Jakob Alt (1789–1872), Marina Grande, Capri (1836), watercolour, 41.1 x 51.7 cm, Albertina, Vienna, Austria. Wikimedia Commons. Jakob Alt’s view of Marina Grande, Capri (1836) is an extraordinary watercolour, with its painstaking detail. His view reverses Blechen’s, looking across the harbour from the east to the west, and drops almost to water level. Alt visited Italy in the mid-1830s, during which time he too painted the Blue Grotto, as well as a stunning view of Rome, also in watercolour. Marie-Caroline de Bourbon (Princess Caroline of Naples and Sicily) (1798–1870), Brothers in the Carthusian Monastery of San Giacomo, Capri (1842), further details not known. Image by PierreSelim, via Wikimedia Commons. Marie-Caroline de Bourbon, Princess Caroline of Naples and Sicily, seems to have been an enthusiastic painter, as well as being an avid collector of landscape paintings. The last serious Bourbon pretender to the crown of France, she seems to have visited Capri in the early 1840s, after being released from imprisonment in the Château of Blaye, and before she moved to a palazzo on the Grand Canal in Venice. 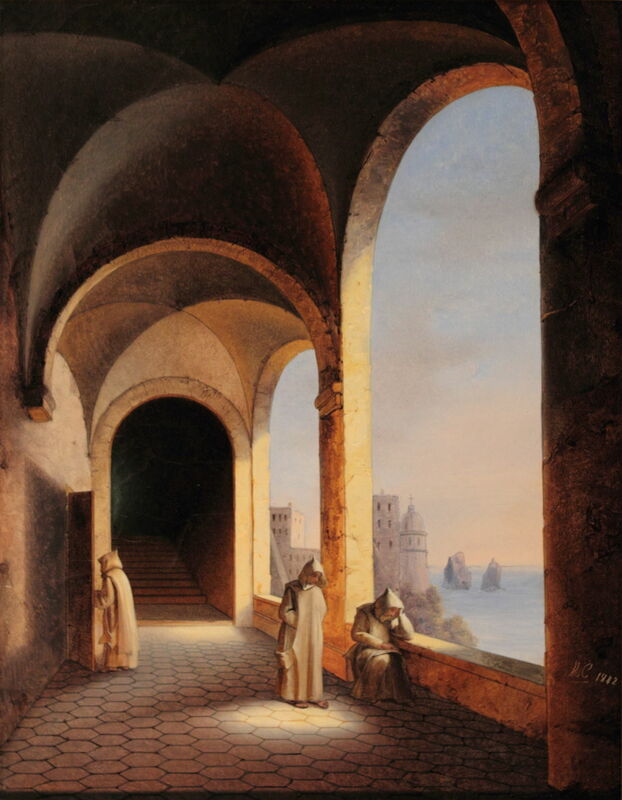 Her unusual painting of Brothers in the Carthusian Monastery of San Giacomo, Capri (1842) incorporates a vignette landscape view of the coast of Capri, almost in the style of a Renaissance painting. Albert Bierstadt (1830–1902), Fishing Boats at Capri (1857), oil on paper mounted on canvas, 34 × 49.9 cm, Museum of Fine Arts Boston, Boston, MA. Wikimedia Commons. I had not realised that the great American landscape painter Albert Bierstadt had visited Capri, but he seems to have done so on his way back to New Bedford in 1857, from his training in Düsseldorf, Germany, only six years after he had started to paint in oils. 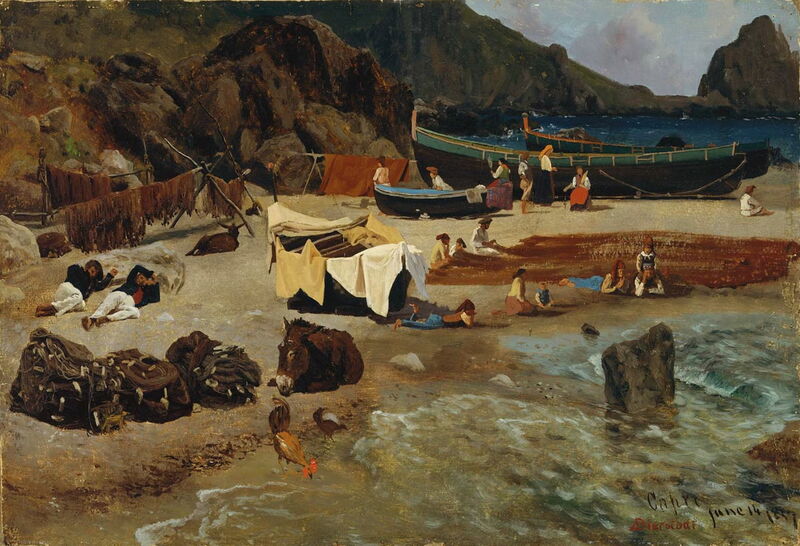 His Fishing Boats at Capri (1857) is painted in oils on paper, suggesting that it may well have been started in front of the motif, and is quite unlike his mature style. His beach is perhaps a little too cluttered, but he has used a variety of techniques to model the different surface textures. Albert Bierstadt (1830–1902), The Marina Piccola, Capri (1859), oil on canvas, 106.7 × 182.9 cm, Albright-Knox Art Gallery, Buffalo, NY. Wikimedia Commons. Bierstadt’s The Marina Piccola, Capri was painted onto canvas in 1859, when the artist made his first journey westward to sketch American landscapes, and is more typical of the drama of his mature style. This smaller harbour is on the south side of the island, to the south-west of the town of Capri, and this view looks to the east, showing the sea stacks of the Faraglioni in the distance, at the right. William Stanley Haseltine was another great American landscape painter associated with the Hudson River School, and first met Bierstadt in Düsseldorf in the mid 1850s. Hasletine lived in Rome in 1857-58, and drew and painted both the Roman campagna and Capri during that time. Having made his reputation with dramatic depictions of the coast of New England, he moved back to Rome in 1867, from where he travelled to paint across Europe. His paintings of Capri from this period proved popular with visiting Americans, and remain among some of the finest realist views of the island. Arco Naturale, Capri (c 1870) shows another of Capri’s famous sights, a natural rock arch on its short eastern coast. William Stanley Haseltine (1835–1900), Isle of Capri: The Faraglioni (1870s), oil on canvas, 83 x 142 cm, Princeton University Art Museum, Princeton, NJ. Wikimedia Commons. 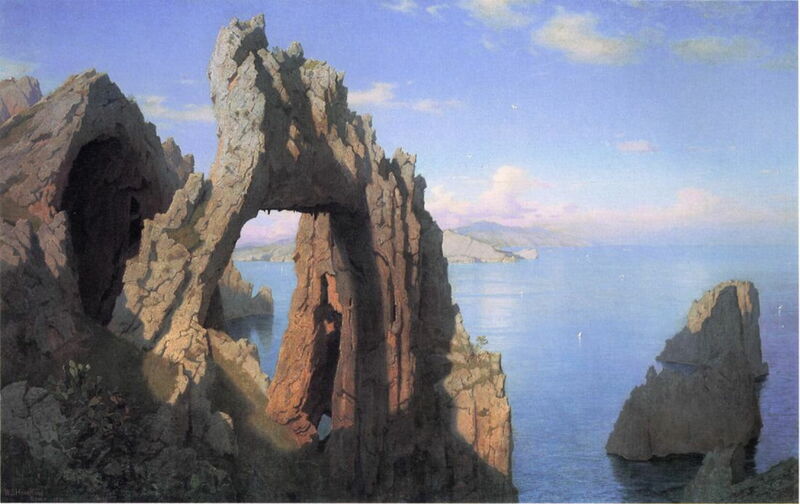 Haseltine’s Isle of Capri: The Faraglioni (1870s) shows these stacks from the north-east, and was probably painted at the Villa Malparte, to the south of the Arco Naturale. He skilfully suggests scale with the tiny boats shown at their foot, although I think there may be a degree of exaggeration here. Alessandro la Volpe (1820–1887), View of Capri (1875), oil on canvas, 52.5 x 106.5 cm, location not known. Wikimedia Commons. Alessandro la Volpe was not only Italian, but was born in, and worked from, Naples. 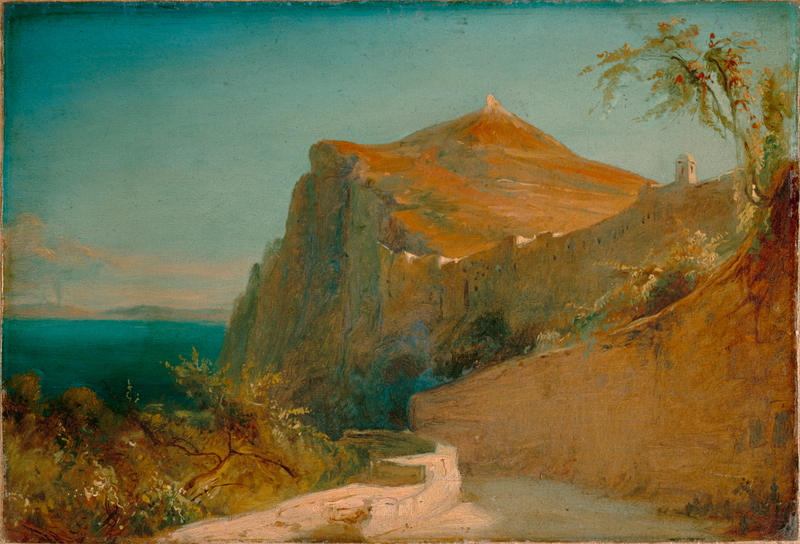 His View of Capri (1875) shows the island in a heat haze, from the hills above Sorrento, to the north-east. Hans Peter Feddersen (1848–1941), Marina Grande, Capri (1877), oil on canvas, dimensions not known, Museumsberg Flensburg, Flensburg, Germany. Image by anagoria, via Wikimedia Commons. Hans Peter Feddersen was another former student from Düsseldorf, although rather later than the time of Bierstadt and Haseltine. 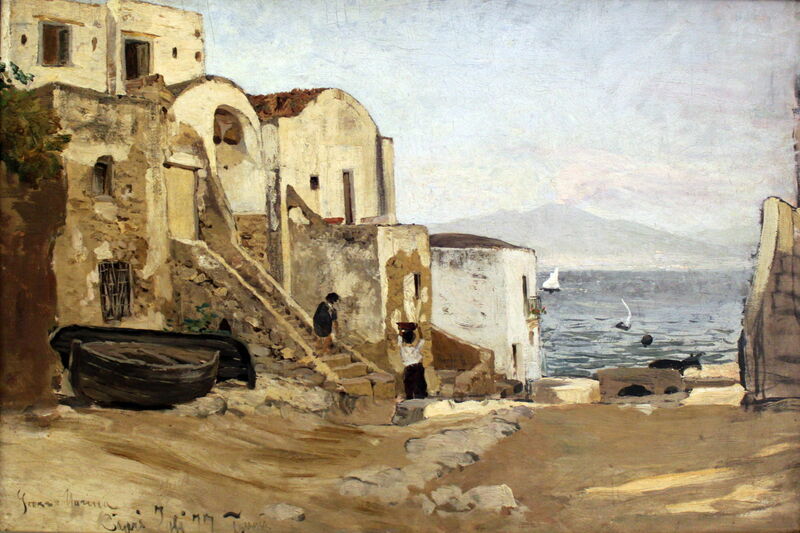 He visited Italy, including Capri, from April to June of 1877, when he painted this view of the Marina Grande, Capri (1877) in oils, probably en plein air. Rather than follow early examples, he looks to the north across the harbour, with Vesuvius in the background, I believe. Albert Hertel (1843–1912), View of the Shores of Capri with People (1879), oil on canvas, 173 × 143 cm, location not known. Wikimedia Commons. Albert Hertel trained in Düsseldorf in 1868-69, prior to which he had lived in Rome for several years, as a student. He established himself as a landscape painting in Berlin, from where he seems to have returned to Italy, and visited Capri, in the late 1870s. 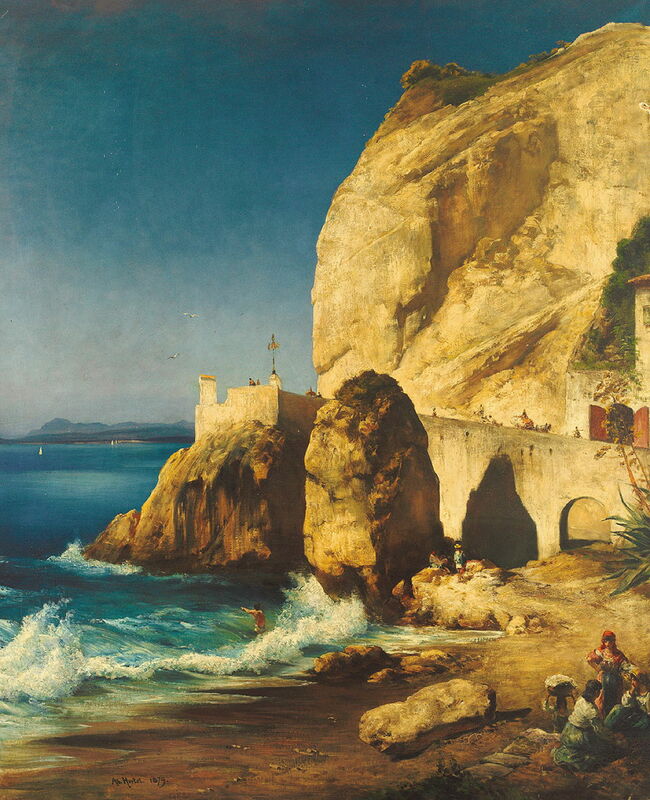 His View of the Shores of Capri with People (1879) appears to show a small bay near Punta Carena, at the south-western tip of the island. 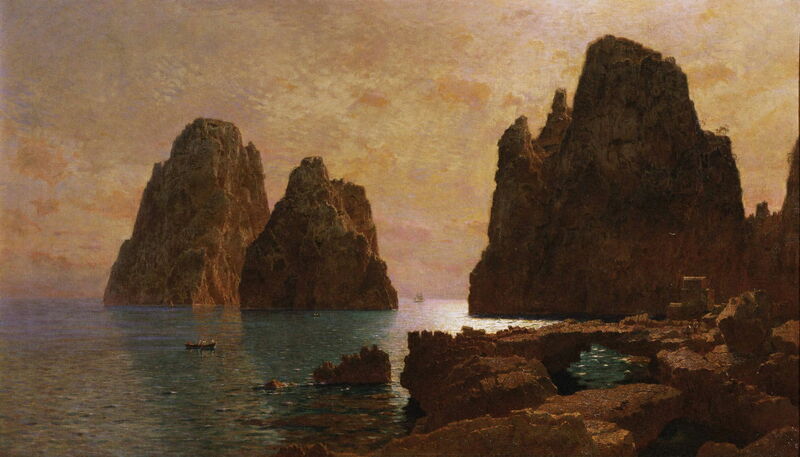 The next article will look at paintings of the coast of Capri after 1880. Posted in General, Life, Painting and tagged Alt, Bierstadt, Blechen, coast, de Bourbon, Feddersen, Fried, Haseltine, Hertel, la Volpe, landscape, painting. Bookmark the permalink. Welcome but what is Howard? Howard is my first name.